Walking near the pond in Reinfeld is interesting, I do always find birds there. 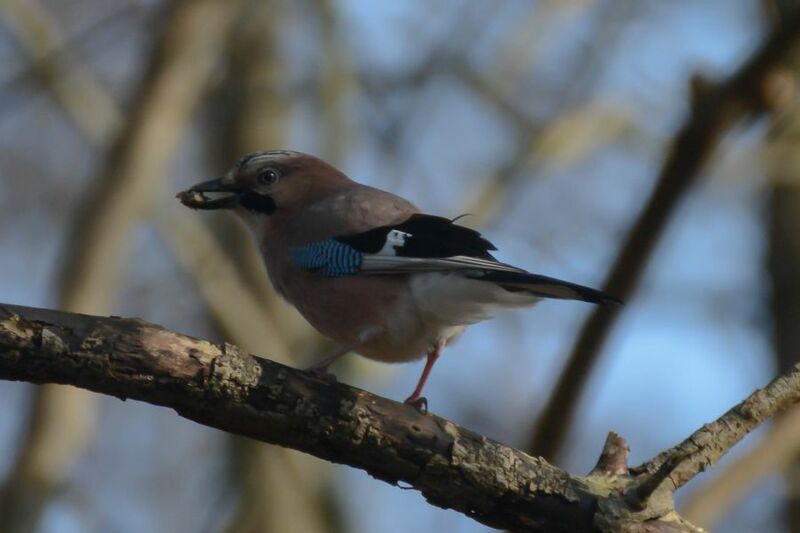 Today I went out for a walk again, and apart from different birds, I saw the bird you can see in the photo, the bird is called Eurasian jay (Garrulus glandarius). I saw this bird already a few times there, for example some weeks ago but I didn’t upload the photos yet. I did also record a short video of this bird a few weeks ago, but I was too lazy to upload it to YouTube, but I will do this soon. Talking about the photo I shot today, I didn’t notice the detail that the bird did carry something with the beak, that is something I noticed at home when I was looking at the photo. Good shot of a pretty little bird. Beautiful bird! And so different from the jays we have here. We also have black jays here… are yours black? Ours are blue with a black head with a crest. I wish I knew how to paste a photo into comments because I have quite a few photos of them. We also have a gray jay that lives in the mountains but I don’t have any photos of it. I love the wing markings on yours! A beautiful bird … wonderful colors … and a great picture. Those little ones are hard to catch!